We live in a consumer society, always being urged to buy new things. I'm trying to move towards a simpler lifestyle by recycling things. I don't mean that I rummage through skips and dumpsters to find food and so on - there are many things that are given to hospice or op shops (a.k.a. thrift shops) that can have a new lease of life in some other way. If you're a regular reader of my blog, you will have seen the Traveller's Blanket that I've been making. 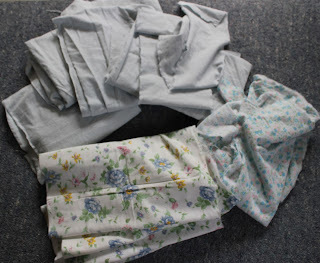 I loved the soft, warm flannel this is made of, so I decided I would make some rag quilts from old sheets and nightwear. In New Zealand, these are made from flannelette (very similar to flannel). This tutorial is written for anyone who is thinking the same was as I am. NO special equipment is needed - you need access to a sewing machine, however, and basic sewing skills. That's all. 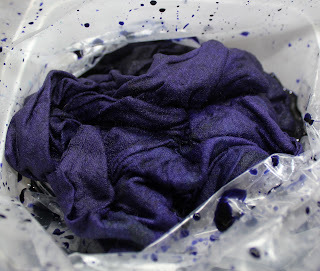 We're going to overdye the fabrics with colours of our choice, and this first part of the tutorial will show you how to do this. 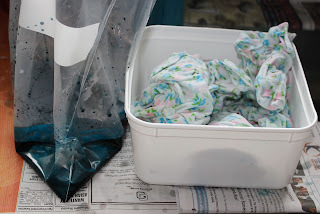 You can buy fabric dye (Procion is the best type) from some craft shops or buy online from Tillia Dyes (www.tillia.co.nz). 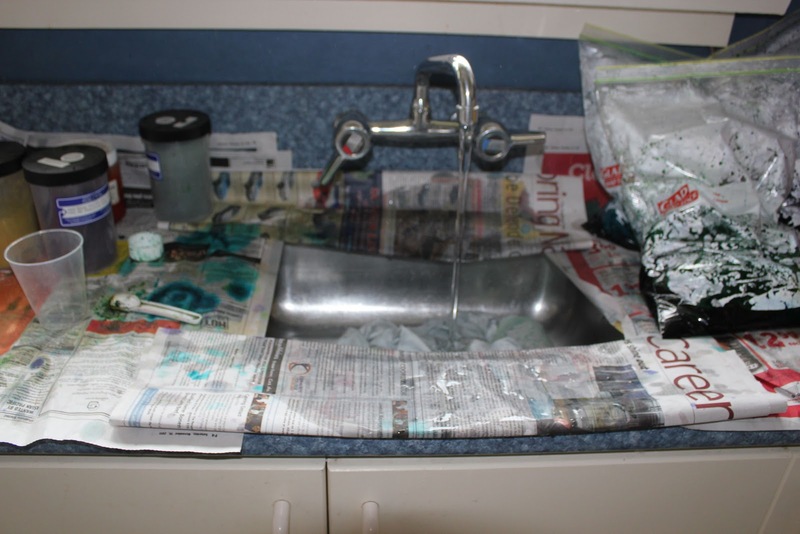 You will also need soda ash, which is the dye fixative. I bought some (mainly odd) sheets and some nightwear from op shops. ("op" stands for opportunity, if you're not a Kiwi). 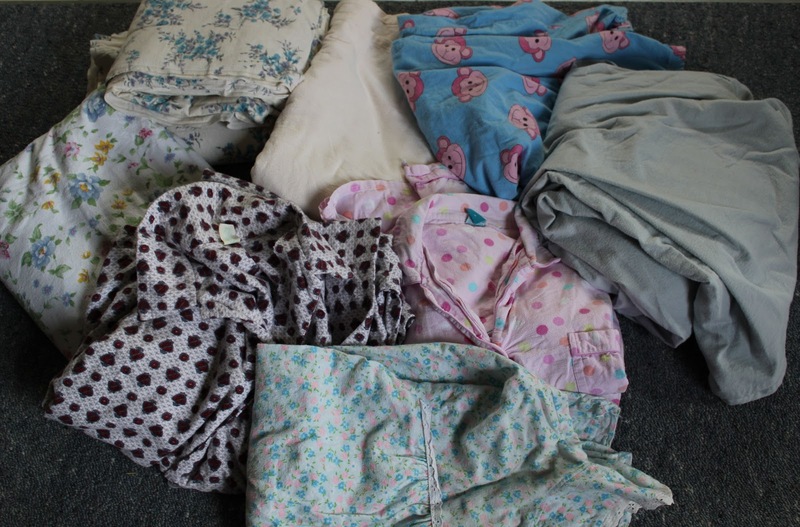 The most I paid for anything was $8 for a pair of double sheets with pillowcases. I bought plenty - this is enough for a number of quilts. Don't use any fabric that's very thin or worn out, as it won't last. If you have sheets with holes in them, make sure you're using the better fabric nearer the edges. If you're buying nightwear, go for big sizes that give you more fabric for your dollars. Look for patterns and colours that have light or medium backgrounds - you won't be able to overdye a really dark fabric. 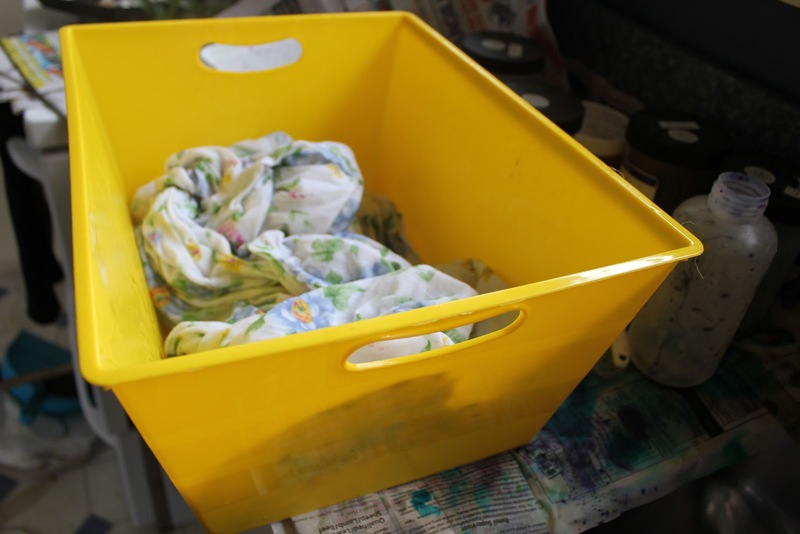 Mostly, the goods you buy will have been washed - we're going to wash the fabric in very hot water after dyeing so don't worry too much about washing everything first. For the first quilt, which is for me, I am using the nightie at the front, the blue sheet on the right, and the pillowcases from the floral sheet set on the left. I've cut one of the floral sheets in half to use as the middle layer instead of batting. First, I tore all the seams off to give me fabric pieces or strips. Don't worry about the size of these at this stage. Sometimes, the fabric will tear into strips by itself as you rip it. That's ok, unless they're very narrow in which case, discard these. You'll also find that not all the seams on sheets are on the straight grain. You can discard the seams, plackets, cuffs etc that you've torn off. 1. Clear the bench. You don't want any plates, cutlery or food around where you're working. 2. Cover the whole bench with a good layer of newspaper. 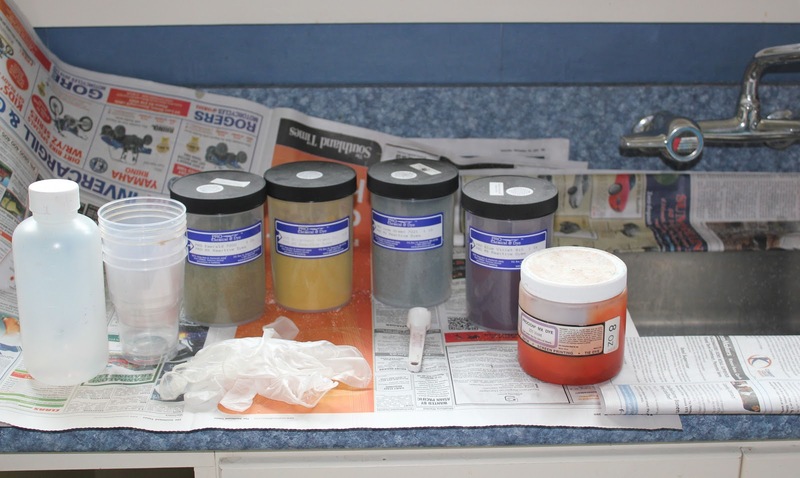 I have a good mixing jar (on left) that has 100ml gradations and a tight-fitting lid, ideal for mixing dye in; some disposable cups, disposable gloves, a measuring spoon and a range of green and purple dyes. 3. Mix the soda ash (3/4 cup to 3 litres of hot water) in a bucket. Unused mixture will keep if sealed in an ice-cream container or similar. Keep this mixture away from children and animals. Use something to stir this with that is NOT used eating. 4. 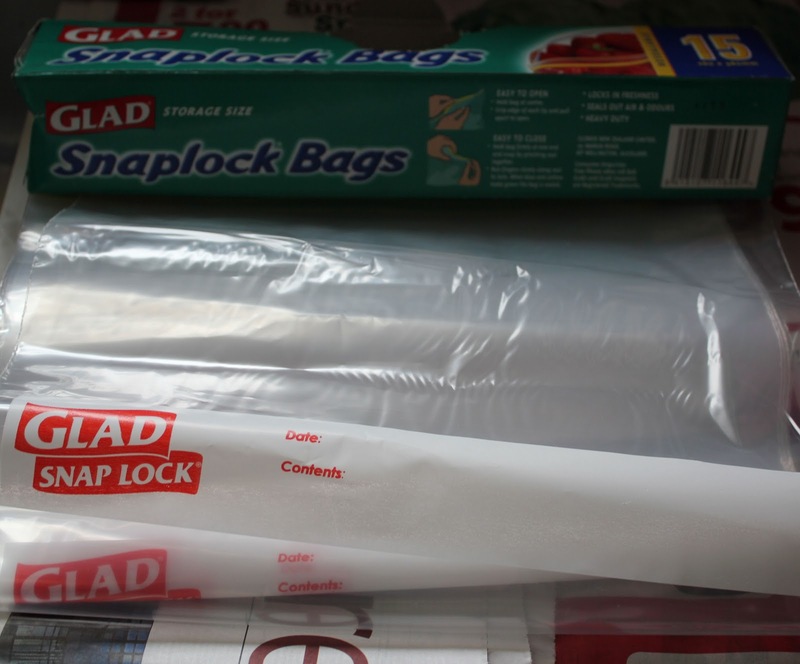 Grab some LARGE Snaplock or Ziploc bags. I recommend these over ordinary plastic bags for 2 reasons - firstly, they're good quality and don't usually leak and secondly, it's a big help to be able to seal the tops. You're going to use these to put the dye and fabric in, and believe me, you don't want the bags falling over and spilling. 5. 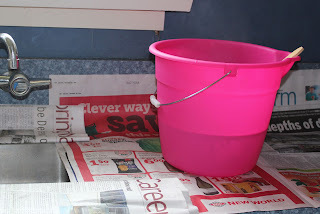 Mix the first dye as per the instructions - usually, 1 teaspoon to 100 mls of hot or warm water for a dark colour. Hot water mixes more easily. Shake to mix or stir well. As a guide, I'm using about 300mls of dye for each of my bags - that's just over a cupful, and is plenty for this amount of fabric. Wet the first fabric that you're dyeing - this is the nightie I'm using here - and again, hot water is best as it penetrates the fabric more easily and ensures that it's wet through. 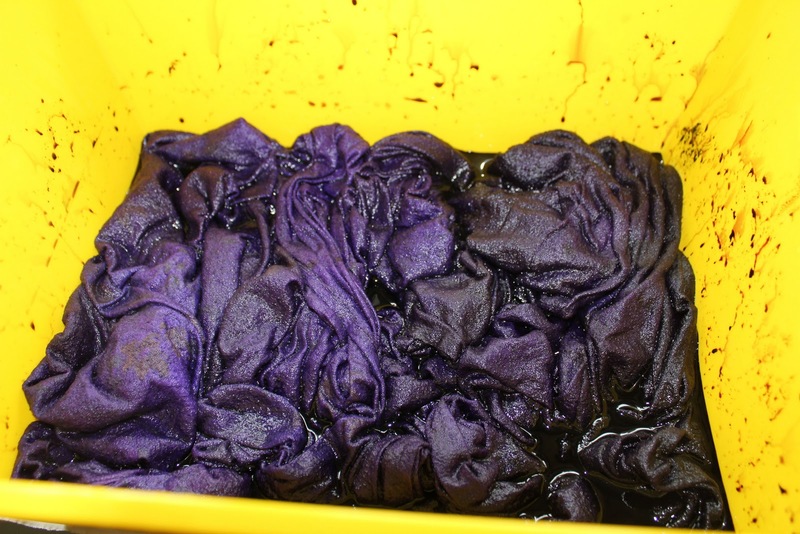 Yes, you can dye dry fabric but it doesn't work as well. 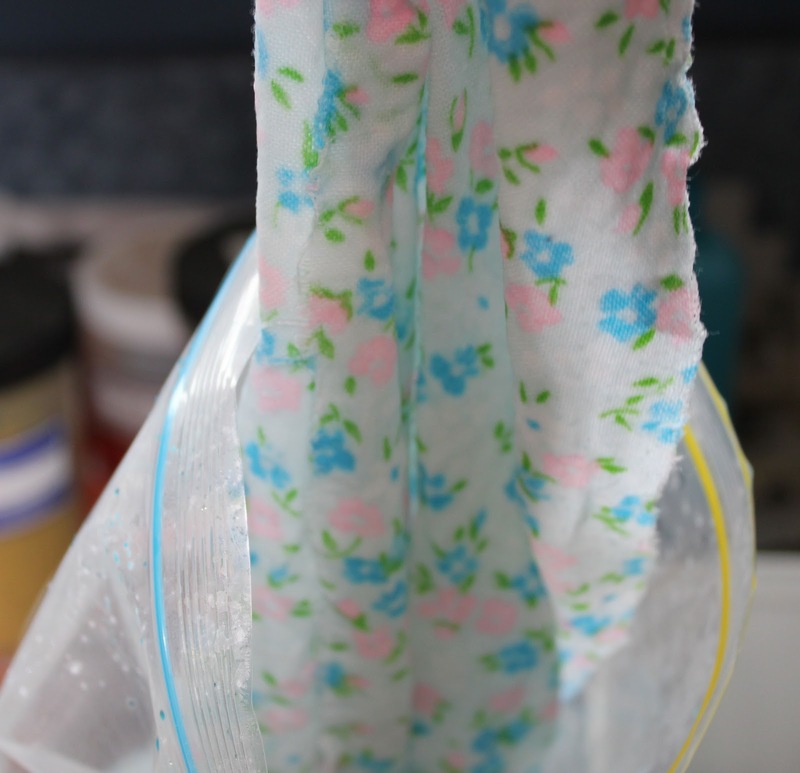 Pour the dye into the first bag, and have the wet (but squeezed) fabric handy. 6. 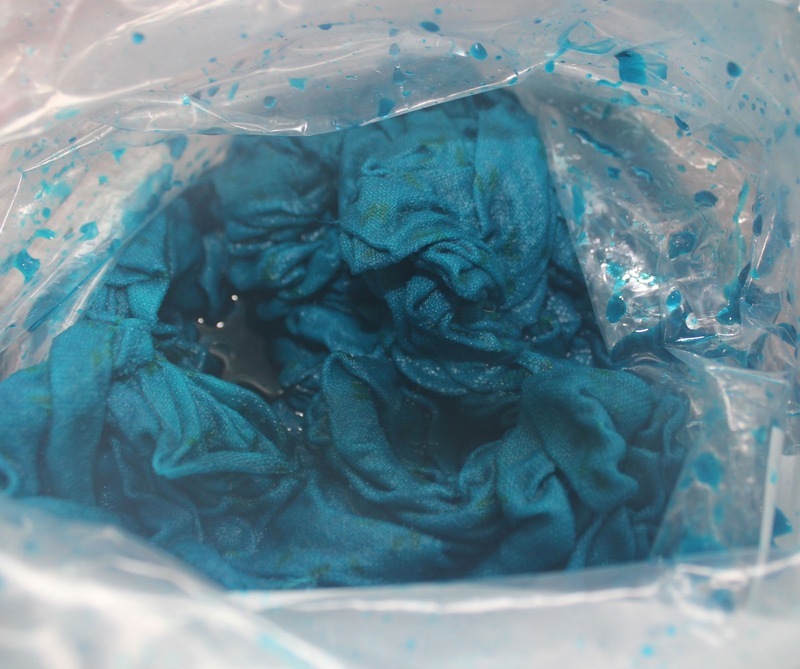 Open the wet fabric out to put it in the bag with the dye. 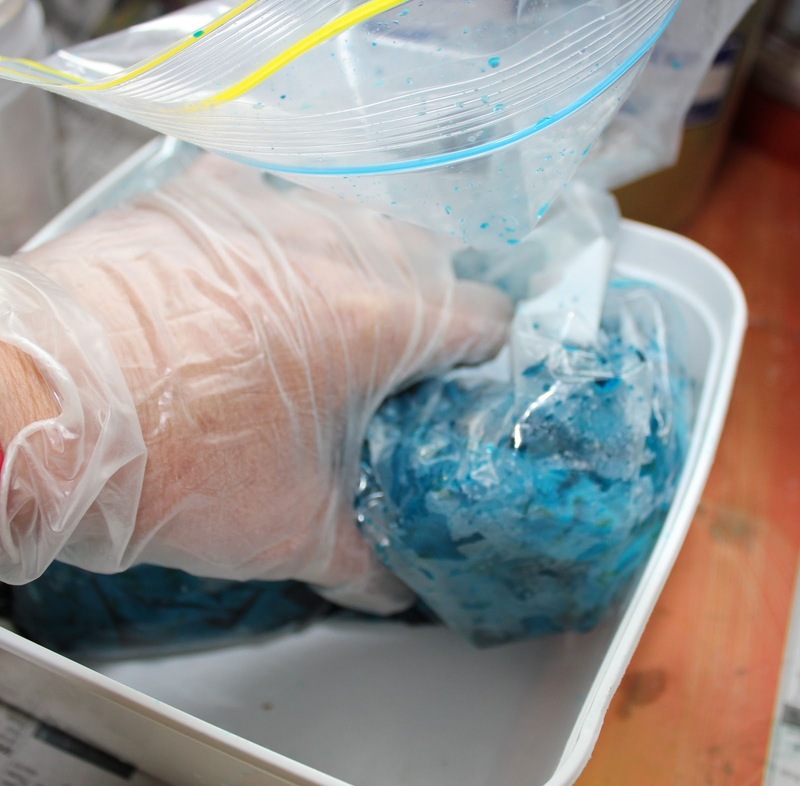 If it goes in in a ball, the dye will have trouble getting through all the layers. 7. Squadge (that's a technical term - just kidding! it's the noise the dye and fabric makes as you squeeze it) the fabric around in the dye. You can do this from the outside of the bag, or stick your (gloved) hands right in these so that the dye gets into the fabric evenly. 8. This is Jade Green. Don't get too excited over the colour yet - it lightens up when you add the soda ash, and dyed fabric is ALWAYS darker when wet. How much soda ash to add? Around the same amount as the dye, so about 250-300mls (a cupful). Squeeze this through the fabric too. You only need to squeeze it enough to ensure it's mixed thoroughly - no need to give the bags a full body massage. 9. The floral pillowcases are Blue-Violet, and the sheet is being dyed in other greens (Brightest Green and Emerald Green). Same process as before. 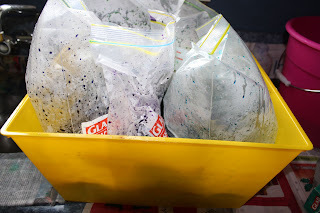 As you finish with each colour, seal the tops of the bags and set aside. See why we need all that newspaper? 10. I'm using half a double sheet for the centre layer, and this is too big to fit in a bag. I have some of these plastic bins that I bought from The Warehouse for $6 each, so I'm using one of these for this large piece. 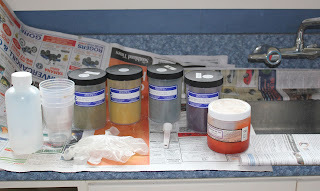 This time, I need 500 mls (2 cups) of dye liquid, and the same of soda ash. 11. This is how it looks. The colour is Grape with some Blu-Violet added to link it in with the pillowcase pieces which will be on the back and front of the quilt. You are going to see this layer, which is why I'm dyeing it. Unlike a conventional quilt where the batting is hidden inbetween the layers, it's visible in this one. How? You'll see in Part 2, when we come to put the layers together and start sewing the quilt. 12. I'm using another of these bins to hold the bags of dyed fabric. It's best to leave these overnight or for 6 to 8 hours at least to get the best depth of colour, so put them somewhere that small children and animals won't knock them over or get into them. Tomorrow, I'll rinse the fabric out and give it a hot wash. Tomorrow # 13, This is so exciting, just the thing needed after a year's study, a cold winter or a family funeral.You tell us in such a way, what could it be but GREAT FUN.. Is the year's study all done now?? I am given lots of inspiration, and am waiting to follow the rest of the tutorial!!! Fond Cheers from Jean. LOL I should have known step one involved dye! your blog is a good one. need to say i like it) and this post is great as always! It looks nice, the way you recycle all sheets in different colors. Very nice work,but i dont want to try this at my home because so much trouble in this work,and if i do this and pour color every where so my mom kick me out! hahhaa but really your sheets looking so nice. I like your article so much,you provide so many interesting things here that how we use our waist by recycling these product and i like your article so much because you describe all steps of recycling so nicely.Thanks for all this effort for us. This is first time i listen from some one that also we make these rag by recycling these sheets,wow you made it very well and also define so easily.I must try this at home.